Ultimate Dana 44 + AEV highsteer + Hydro Assist? I'm trying to upgrade to hydro assist and an Ultimate Dana 44 front axle to more reliably run 37s. 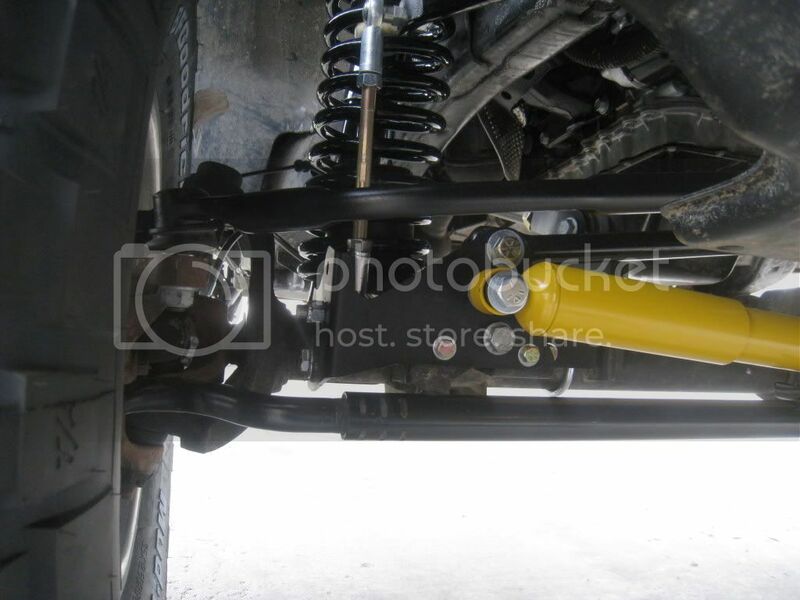 But I'd like to keep my AEV 3.5 SC suspension with the AEV high steer/flipped draglink. Has anyone successfully run this combination? And if so, wouldn't you mount the assist cylinder to the axle? I'm willing to ditch the AEV track bar bracket. The issue is that the Ultimate Dana 44's raised track bar bracket is only raised 2in instead of 3. It also comes with a strange mount for a stemmed steering dampener. Rebel Offroad quoted me an insane price to cut off the track bar bracket and weld on a Synergy one (I thought it'd be like a $200 or less job). Neither AEV or Dana/Spicer have returned my emails asking how they recommend installing this set up. And the AEV track bar bracket doesn't seem strong enough to support a ram assist. Is there an easier way to raise the Ultimate Dana 44's track bra bracket another inch? Just find a competent welder in your area, there's always someone looking to make an extra buck. You'll wanna pull the axle, cut the old bracket off, grind the area, and have everything ready to go for them. If you do all this prep work, I'm sure someone will burn it on for you for <$50. It only takes 5 minutes. Go with the Synergy or Artec weld on brackets. Another question to ask yourself: are you rock crawling? If not, you don't need hydro assist. It changes the handling characteristics of your Jeep, will take some getting used to, can be twitchy/flighty on the highway (depending on the ram setup), and adds more failure/maintenance points (hydraulic lines). I wouldn't add it to your list if you're not going to regularly find yourself on black/red trails, spending a majority of your time crawling some technical stuff. That's what I'm hoping. Although I live in Venice, CA. Land of $60/tire mounting charges. So nothing "blue collar" is cheap. I don't spend the majority of my time in the rocks. But I split my time between what'd be considered overlanding-style trails and Rubicon, Dusy, Moab rock crawling trails. And my power steering is already pretty mad at me just doing the 3 point turn required to get into my garage. From what I understand, adding hydro assist takes stress off of the draglink, sector shaft and steering box. And plugging the lines from the steering box and going back to regular power steering seems easier than replacing a sector shaft on the trail. For twitchiness, I don't really want that. Others running the factory power steering pump, 1.5in cylinder seem to report that it still feels like stock but with added boost. I'm hoping that's true and not an exaggeration. I guess the other option is just switching to PSC's HD steering box. If you are in the area stop by and I will do it for a 6 pack of blue moon. You can't beat those kinds of prices! Dang. I've run a WTOR hydro boost setup on my JKUR for years. I've never had any issue with flighty steering, etc. Some of the best money you'll spend on a build. If you have a raised bracket on the Dynatrac axle then you'll ditch the AEV bracket. On mine we welded the tabs provided by WTOR to the raised bracket and used a PSC tie rod clamp to mount the ram. Works great. You should be able to retain the flipped drag link AEV provided with no issues. That's basically the plan. The issue is that its a Dana Ultimate 44 (a lot cheaper than the dyna prorock). I can't remember where I read it, but supposedly their track bar mount only raises is 2in over stock. Where most others, including my current AEV set up, raises it 3in. So it ends up being an annoying amount of fab work to raise it that extra inch. Maybe it's unnecessary? Lol, I thought the same thing. But you like what you like I guess. If I was in the bay area, I'd take him up on it. The pricing is actually pretty similar. The WTOR ram assist set up is around $500. Plus I'll add a cooler for another $120 or so. Seemed like a win/win taking stress off the steering box, draglink and frame mounts and moving it to the tie rod and knuckles. But we'll see. Thanks for all the suggestions guys. As I've moved more into crawling and less bolt on mods, the AEV and overlanding forums have become pretty useless. A year late on this thread but I'm fighting bump steer with my Ultimate 44 and trying to look for other options besides cutting and welding on something Dana's engineers should have accounted for. I called them last week and they said they haven't had ANY complains of the track bar bracket being too low. I call BS on that one. So Klaus, what did you end up doing? Quick Reply: Ultimate Dana 44 + AEV highsteer + Hydro Assist?